1001 for Mac OS X is a desktop client to be used in conjunction with Flickr. It not only uploads photos to your Flickr account, it notifies you anytime new photos from either your contacts, everyone, or your favorite tags are uploaded. 1001 allows you to step into the stream of photos passing through Flickr and to quickly see what’s new at the moment. Just run the app in the background and if triggered, 1001 pops up a small unobtrusive window to notify you of new photos. Background Switcher periodically changes the background image on your computer (like every hour or every day). You can specify which pictures to choose from in any of the following ways: you can select a list of specific pictures on your computer, you can point it at a selection of folders on your computer, such as ‘My Pictures’ and it will select random pictures from there. You can select pictures by person, tags, sets or just plain random and there are a host of options to narrow down the pictures and increase the quality of those chosen. Desktop Flickr Organizer for Gnome allows online/offline mode management of your photos. You can upload, search and download photos, through the easy to use interface. Flickr Exporter for Aperture is an export plugin for Aperture which provides a direct export interface to Flickr.com. It allows to edit photo titles and descriptions, and add tags to them, create a new photoset with your photos, or add them to an existing photoset, automatically send your photos to a Group Pool on Flickr, choose from a list of your Flickr tags and add them to your photos before uploading, and many more. Flickr Exporter for iPhoto is a plugin for iPhoto which provides a direct export interface to Flickr.com. FlickrExport can update iPhoto’s database with the titles and descriptions you give your photos. It can resize your photos before uploading. Flickr Finder – Mac OS X application for browsing your photos. Flickr Notifier is an RSS reader that displays photos on your desktop from your friends’ accounts as they are uploaded. Perhaps, the first RSS notifier that displays images. Flickr Screensaver v3 turns your screensaver into a slideshow of your Flickr photos. FlickrDown makes it easy to save photos from Flickr to your hard drive. FlickrFaves is a small, simple, cross-platform tool for downloading high-resolution versions of your Flickr favorites to your harddrive. FlickrUploadr is a tool for Linux to upload your pictures to Flickr. It is is written in Python and Gtk. jUploader is a cross platform, cross-site Photo uploader. Currently it runs on Windows Linux and OS X and supports both Flickr and Zooomr. It allows you to set all properties of a photo before you upload it. It also supports batch editing, so you can make short work of uploading a bunch of files. Nostalgia an easy and elegant solution to get our photos online. It is a feature rich application that allows you to search flickr remotely and create local sets from the photos you discover. It also supports local photo management and synchronizes to your flickr account, allowing you to update your online photos as well. Flickr Sidebar is used for viewing and searching photo lists. You can access it by the command key Ctrl+Shift+F, the toolbar button, or clicking on the menu option View|Sidebars|Flickr Sidebar. Once you have authorized the extension to work with your flickr account, you can search through or view a full list of your photos, your favorites, everyones photos, your individual contacts, or your groups. FlickrFox provides an easy way for Flickr group administrators to monitor their group pools. flickrgethighrez lets you directly get any Flickr photo in the larger resolution possible. Fotofox allows to easily select, tag, title and upload pictures from your computer to an online photo service. Works with Flickr, Tabblo, 23hq, Smugmug, Marela, and Kodak EasyShare Gallery. OakFlickr4PFF is Flickr photo Uploader Addon for Performancing (1.3+) for Firefox. It will check the pictures in the publishing blog, upload the local ones to flickr and update the link to url of flickr. 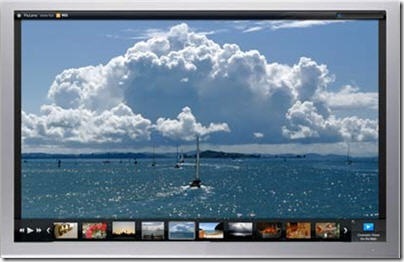 PicLens delivers an immersive full-screen experience for viewing photos on the Web. It allows to view photos in full screen with a single click, play a slideshow of image search results and photo albums, and more. Uploadr for Flickr is a localized flickr.com in china, which provided an extension to directly upload images on web pages to it. Big Huge Labs – a huge collection of little games to play with Flickr photos like making badges, motivational posters, mosaic, calendars, and many more. Bubblr is a tool to create comic strips using photos from Flickr. Fastr is a game that uses flickr images. It loads ten images that all share a common tag, one by one, and you guess what the tag is. When you guess right, the tag will turn blue, and you’ll get points. The faster you guess, the more points you get. Flickr Chia Pet grow Chia hair on any photo. FlickrLogoMakr turn any words into a Flickr-type logo with their font. Flicktionary offers a compound word game. Hamster Sudoku uses images of hamsters from Flickr for you to play a picture version of Sudoku. Memry is a classic memory game based on Flickr images. You can enter a tag and play with images that match it. 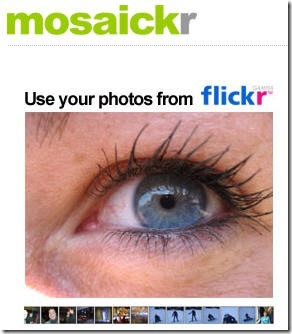 Mosaickr offers to create beautiful mosaics from your flickr pictures, and even print them on posters. Creating a mosaick is free. Printing posters starts at 0.99 Euro. Printr Killr offers to make a calendar with your photos. Tag Man is the classic game of hangman by guessing the letters in a random photo tag. Ajax Photo Blogging in Flickr allows to post a story about the photo to your blog and add a description or comment on it automatically. There’s no need to save your blog password in Flickr. Flickr 5 Stars Ratings adds star ratings to your photos. Flickr Ad Removal gets rid of text ads in Flickr (the ones that show up after using AdBlock to get rid of the graphical ads). Flickr All Sizes Menu adds a menu to select which size to see when hovering on the All Sizes button. Flickr AllSizes+ allows you to access all sizes for a Flickr photo, copy the code and download the image. It provides quick access to shortcut functions – download images, copy code to clipboard, view images, etc. Flickr Auto Page is a greasemonkey script makes small changes to the interface removing the need for you to click on the pagination number and wait for loading times every time you go to the next/previous page. When you browse paginated pages on flickr*, the script will fetch the next page and append it automatically at the end of the current page while you scroll down. Flickr Auto Tag gives you a select box to quickly access the tag combinations you often use. Flickr BBCode Generator is a text box with the BBCode automatically generated when you go to the “All sizes” page for a given size. Creates BBCode to display the image and provide a link back to the Flickr page, as per Flickr’s user agreement. Flickr Contacts Organiser lets you add tags to any flickr user, you can then view the tagged users via a whole range of different filters, including view by tag, view tagged users photos, favourites, testimonials,most interesting photos, photos of that user etc. Flickr EXIF Decorator – lets you hover over a photo and puts a translucent overlay in the top left corner which shows you information about the camera. Flickr GeoRadar is a GM script to search closest photos. A radar screen will be displayed on the left, and green points on radar indicate the locations of nearby photos. The thumbnails are on the right in order of distance from current photo, and arranged from left to right, then top to bottom. When the mouse is moved over any of the thumbs, the corresponding green point on radar will turn to red and a small compass will appear to show the direction. Flickr Group Display helps manage memberships in groups based on number of views and favorites. When viewing your photos sorted by Views or Favorites, the script will determine which groups each photo belongs to, and display the group information next to the photo, to make it easier to determine which photos need to be moved to new groups. Flickr Image Src Exposer adds an “IMG LINK” tag making it so you can download any photo. Flickr Mail To adds an email button to the Flickr photo toolbar, and also a “Send Page” link to the top of every page on Flickr.com clicking it takes you to either the Flickr Mail compose page, with the subject and body prefilled, with the link and title of the photo. Flickr More Home add more content to your home page. Flickr Photo Magnifier – Adds a magnifier to the toolbar to see details in photos. This is an adaptation of the TJPZoom image magnifier by János Pál Tóth to work on flickr images. Flickr Photostream Graphr lets you graph how many times your stream has been viewed. Flickr Quick Comment Adds a select box with pre written comments. You can create new comments and manage existing commands via the User Script Commands menu. This script is now localised in French, Portuguese and English. Flickr Q u i c k r v0.3.3 – Add thumbnail/buddys & NavBar. Also removes all Yahoo ads and bloacked images. Flickr remove spaceball removes the empty image (download deterrent) positioned over some photos on Flickr. Flickr Rich Edit – Gives you more options in the comments box when it comes to the font. Flickr Search for Creative Commons will force all searches on Flickr to return creative commons images. Flickr Show Licenses shows licenses on all pages, to load those licenses automatically (no mouseover), and to leave (cc) licenses alone, displaying only the (c) symbol where appropriate. Flickr Titles + Descriptions Batch Tools adds 7 new tools for batch editing titles and descriptions. Flickr/Shutterfly Integrator gives you the ability to order prints of Flickr photos via Shutterfly. FlickrCommentTools allows you to edit HTML into your comments and include your own photos. Lets you set bold, italic, underline, blockquote, links and insert an image straight off your photostream. FlickrMailManager adds some options to help manage your Flickr mailbox. Including “Mark all as read” and delete all Notification emails, such as “you are x’s newest contact” and Group Invitations. FlickrPM adds icons for mail, profile, favourites, Scout, Interestingness and the user’s photo archive next to usernames in forums and on individual photo pages. It also allows you to send Flickr Mails without leaving the current page you are on. FlickRate adds a rating panel under a current photo in an effort to give Flickr a better ratings system. Geotag Flickr with Multimap adds “add geotags” link to photo pages, which lets u add the latitude and longitude geographical data, via the maps on the MultiMap.com mapping website, to your Flickr photos. FAlbum a WordPress plugin that allows you to display your Flickr photos and photosets on your site. It features configurable and maintained through standard WordPress administrative page. It allows to view album of most recent photos, view photos using tags, view your tags in a cloud format, and more. Flickr Comment Importer imports comments from your Flickr account into your WordPress blog. Flickr Photo Album plugin will pull in your Flickr photosets and display them as albums on your WordPress site. There is a pretty simple template provided, but you can customize the templates 100% to match the look and feel of your own site. Flickr Tag Cloud Widget is plugin for the Widget Sidebar in WordPress. It will display your flickr tags as a tag cloud in your blog’s sidebar. FlickrFaves is a plugin to display users’ flickr favorites on their WordPress sites. Kubrickr is a tool that lets you replace that giant blue blob at the top of your WordPress 1.5 blog with a nice photo from Flickr. You just need to type some words that relate to your blog and push Submit. Choose one of the photos from the that appears, and save the resulting file to your Default WordPress theme directory. SimpleFlickr is a plugin for WordPress that allows you to embed a flickr integrated simpleviewer into your WordPress site. Chasr is a mini web application that allows you to display your photos from Flickr on your own website for absolutely free. You can download Chasr and install it on your own server, allowing your users to see your photos on your own website. 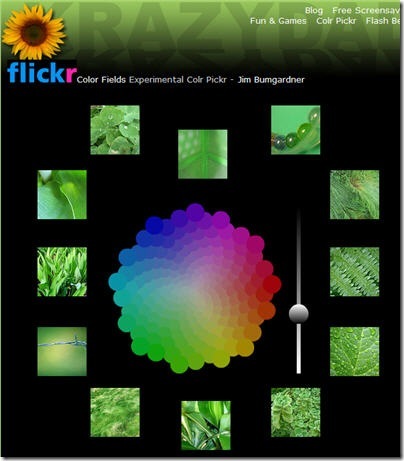 ‘Color Fields’ Color Picker choose a color from the color picker, pictures featuring that color pop up. Flickr Anywhere allows you to put flickr in your myspace account or on any webpage with just a quick search. It takes all your public flickr photos and displays them in a compact flash player. Users can click on the larger image and be taken directly to your flickr site to comment. Flickr Color Selectr – Use a color picker and search only images that are Creative Commons Licensed and match the colors you need. Flickr Module for CMS will allow you to integrate your photo albums at flickr.com into you CMS Made Simple based website. The module is very flexible and the output is templates based and can thus easily be modified to suit your needs. Flickr Slideshow Generator allows you to generate the HTML necessary to embed a custom Flickr Slideshow in your page or blog. FlickrLilli is a nice way to search Flickr. Gickr lets you instantly create Animated GIF online, free, right now! Just upload pictures or grab them from your Flickr. Create funny flashy slideshows with you and your friends, cartoons, previews, banners, etc. Post them anywhere you can post pictures: MySpace, Bebo, Facebook, HI5 etc. No need for flash. 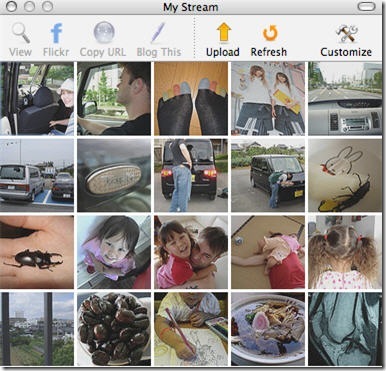 PictoBrowsr is a simple widget that allows the display of pictures stored on Flickr on a site or blog. Flickr is one of the most popular and advanced photo management and community applications on the web. Travelr is a free photo gallery viewer that you can put on your own site. Travelr lets you display your Flickr photos geographically on a world map. Flash Gallery – free application that allows to create an online slideshow from Flickr photostream. Is there a way to allow a visitor to my blog to submit a picture to my flickr group without leaving my blog? http://www.flickrsearch.com Search flickr photos with a variety of options.